The “option ARM” loan program was one of the most popular mortgage choices for borrowers in the United States during the lead up to the mortgage crisis thanks to its forgiving payment flexibility. This same payment flexibility also made it one of the most scrutinized loan programs in history because of its misleading ability to qualify borrowers for a home they truly couldn’t afford. It was offered by some of the biggest former mortgage lenders, including Countrywide Mortgage and Washington Mutual, both of which failed during the Great Recession. I believe Bear Stearns also offered the product. They also failed. In other words, borrowers can make the standard 30-year fixed payment, an accelerated 15-year fixed payment, a 30-year interest-only payment, or a negative amortization payment. That last option was what got a lot of homeowners into a lot of trouble. It allowed homeowners to pay less than the total amount of interest due, thereby pushing many borrowers into an underwater position. Most borrowers select the option ARM for the minimum payment option, otherwise known as the negative amortization option. The minimum payment option allows a borrower to pay monthly mortgage payments that are significantly less than the actual interest rate. The minimum payment on most option ARM programs is 1% fully amortized. It seems like a great deal, but every time the borrower elects to makes the minimum payment, the difference between the minimum payment and the interest-only payment is tacked onto the balance of the loan. A borrower can pay the minimum payment until the loan balance reaches 110-115% of the original loan balance, depending upon the rules of the issuing bank or mortgage lender. This allows the typical borrower to pay the minimum payment for roughly the first five years of the life of the loan. 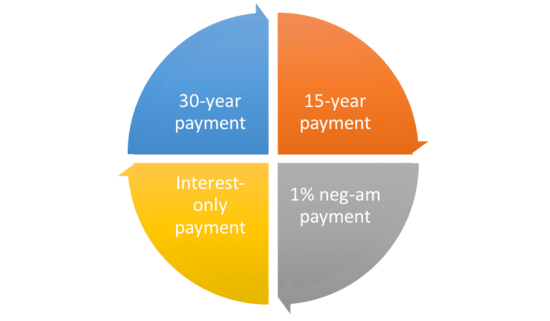 After the borrower reaches 110-115% of the original loan balance (110-115 LTV), they will lose the minimum payment option, leaving them with the three remaining payment options. After ten years from the start of the loan, the interest-only option typically goes away as well, and the borrower must pay using one of the two remaining payment options. Typical option ARM programs do not have any caps aside from the lifetime cap of say 9.95%, and the minimum payment generally increases 7.5% each year until it is no longer an available option. What many borrowers may not understand is that paying the minimum payment each month is simply a way of deferring interest, not avoiding it altogether. By making the minimum payment each month, the accrued interest eventually stacks up against the borrower, while effectively building zero home equity. And after five years of paying the minimum payment, the borrower would have a loan balance above their original balance without the flexibility of the minimum payment option. This makes the option ARM a dangerous choice for homeowners, as once the minimum payment option disappears the borrower has no choice but to pay the interest-only payment. And many borrowers will likely have trouble making the interest-only payment after relying on a much lower minimum payment during earlier years. The only saving grace to this program is housing appreciation and leverage. While the market was hot, real estate investors were using option-arms to keep cash in their pockets, banking on appreciation until they resold the home years, or even months later. But once every one and their mother was using this type of loan, trouble started brewing. It probably should have never been introduced to the masses. 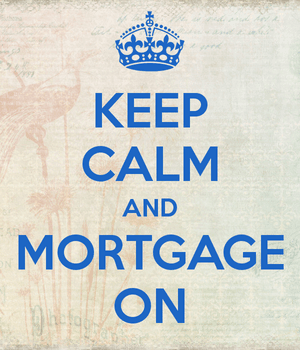 Typical five-year interest-only adjustable rate mortgage at 6.75% is $2,250.00. As you can see, the minimum payment is dramatically lower than the interest-only payment, but it won’t be around forever. And the minimum payment increases each year, as well as the accrued interest. I’ve seen a lot of lender commercials lately offering option ARM programs under the guise of names such as “Super-Saver program” and “Smart Option”. They tend to highlight the benefits, mainly the cost savings without mentioning the negative implications. The newest option ARM program now is the so-called “assured option arm”, also known as a five-year fixed option ARM mortgage. It combines the safety of a five-year fixed product with the flexibility of an option arm. It can be useful for the same reasons I mentioned above, with the security of a fixed interest rate for a small time period. But it’s still a risky loan product, and one that should be approached cautiously as well. All that said, the option ARM program definitely has the potential to save homeowners money, and keep money in their pocket during hard times, but it should be approached cautiously. A loan officer or mortgage broker may recommend the option ARM program as a way to keep your payments down, but if you don’t feel you can make the interest-only payments in the future, and eventually the much higher fully amortized payment, it’s probably best that you look for something more conventional. If you can’t make the fully amortized payment, you don’t really qualify for the home loan. Bottomline. One of these features turned out to be negative amortization, meaning the option ARM as we knew it was a thing of the past. Lenders get certain legal protections if they make loans that abide by the QM rule, and as such most loans are now QM loans. However, it’s still possible for a lender to offer a similar product in the future, but it’s doubtful because they’ll be assuming more risk. And we all know these are risky loans. In summary, the option ARM will go down in history as one of the most infamous loan programs of all time. One could easily argue that they did a lot more harm than good, and were probably one of the main reasons everything fell apart. I am actually looking for a lender who offers option arms? Do you know if anyone still offers these types of loans post-crisis? Haha…no, I do not. But if mortgage rates and home prices keep rising, a lender might start offering the program again to keep things “affordable.” But let’s hope that doesn’t happen again. I’m a student who is doing a research paper on ARM mortgages. One thing I’m not clear on, I don’t believe I have found the right source yet, Are Option ARMs still legal to produce? I’ve seen legislation that banned option arms for “high-priced loans,” and more recently loans with negative amortization have been banned under the Qualified Mortgage definition, which looks like it will be the standard going forward. In any case, no lenders seem to be offering option arms these days regardless. These were the worst mortgages in history…I wonder how many people lost their homes after taking out an option arm.